Women’s J. Crew Sling-back, Lace-up, Espadrilles Size 7. Condition is Pre-owned, worn only 2-3 times! Shipped with USPS Priority Mail. 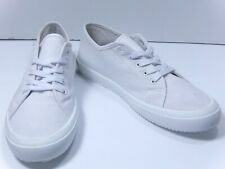 WHITE COTTON LINING,,,, 37 BLACK COTTON WITH ELASTIC INSERTS RUBBER LIKE SOLE WHITE COTTON LINING. 3 3/8 wide brown. RUBBER LIKE BOTTOMS.